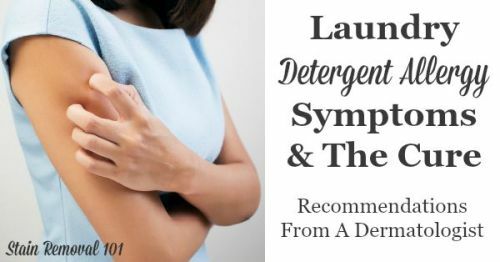 Do you suffer from a laundry detergent allergy, or think you might have suffered an allergic reaction to laundry supplies, such as soap or other products? Find out the symptoms of this allergy, and how to fix it here. Detergent is necessary to clean your clothes, bedding and other washable fabrics that you come into contact with everyday. Unfortunately, because your skin comes into such close contact with any residue that the detergent leaves behind, all through the day and night, these soaps can be one of the big causes of allergy problems for many people. Additional symptoms can include sneezing or itchy water eyes, particularly if you are allergic to the scent of the product. 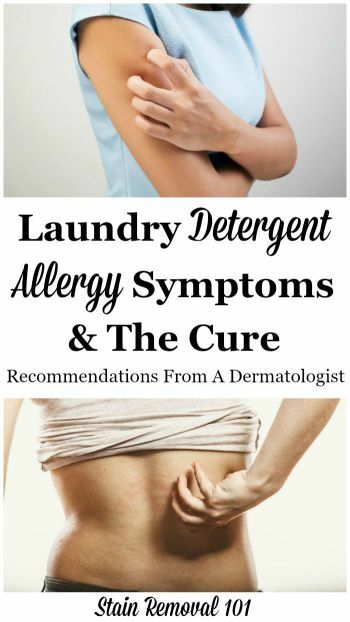 Finally, a laundry detergent allergy can have more subtle symptoms than those listed above, such as tightness in your skin, other rash, and itching, even after showering and applying moisturizer. Generally these symptoms are exacerbated more in the cold winter months too, because of less moisture in your skin. You or your family members do not need to suffer from a laundry detergent allergy anymore, since there are many products on the market, such as hypoallergenic laundry detergents, which are designed to not cause these allergic reactions in the first place. The first thing you want to do is make sure you remove as much laundry detergent residue as you can from your clothing each time you wash it. First, use less detergent to begin with, since many of us use more detergent than we really need to anyway. Follow the directions on the label, and then experiment with using even less than recommended until your clothes no longer come out clean. Then, use the minimum amount that seems to work only, not more. You can also reduce the detergent residue in your clothes by using an extra rinse cycle. Typically the ingredients in laundry supplies that cause most people to have an allergic reaction are the dyes and perfumes contained within them. Therefore, the first step in stopping your laundry detergent allergy is to switch to a new detergent, most likely a hypoallergenic version, often called the free and clear or free and gentle formula. That means you will need to forego all scents. That includes scents not only for the soap itself, but also for other products you use, such as fabric softener, dryer sheets, bleaches, or anything else. 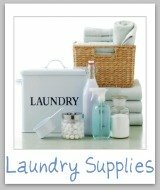 You can also try homemade laundry detergent or natural laundry detergents. Be careful with these though, if they have added fragrances, even natural fragrances or essential oils, because these can still cause allergies. There has also been some discussion that enzymes in these products may irritate sensitive skin. 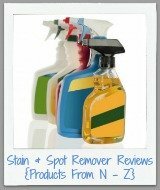 You can read my article about enzyme laundry detergent to learn more about this issue. Ultimately, what one person is allergic to is not necessarily exactly the same as what someone else is allergic to. When treating your laundry detergent allergy you will most likely need to do some experimentation, trying a couple of different detergents until you find the best laundry detergent for you, that does not cause an allergic reaction. 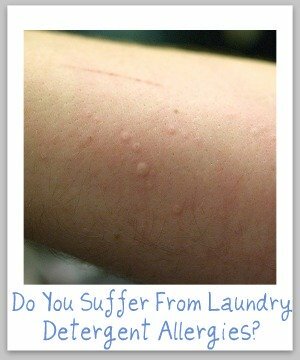 Which Laundry Detergents Cause Allergies And Which Don't? You can share your detergent reviews here, telling which ones caused an allergic reaction, and which did not, to help others fix their own laundry detergent allergy issues. In addition, check out this hypoallergenic laundry detergent list, which also includes links to reviews from readers where available, showing what brands have a free and clear versions, and how it worked. Finally, based on popular demand, I've also created a hypoallergenic laundry supplies list, sharing what products, such as fabric softeners, dryer sheets, stain removers and bleaches are available in scent and dye free versions, and providing reviews of them, when available. If one person in the household has an allergic reaction to laundry detergent then to stop the reaction it is really not enough to use a special soap only on that person's clothing. They will still come into contact with everyone else's clothing, bedding, etc. on a frequent basis and can still suffer from the laundry detergent allergy. To avoid this everyone in the whole house must switch. Like I said in the video above, my son has allergy issues so everyone in my house must use the same no perfumes, no dyes detergent, fabric softener, dryer sheets, etc. It doesn't matter that I like scented laundry -- I like my son allergy free more.